In 1976 Charles Square in Montego Bay was renamed Sam Sharpe Square in honour of national hero Sam Sharpe who was from Montego Bay. Sharpe was executed in the Montego Bay Market Place on May 23, 1832 for his role in the 183132 Emancipation War. 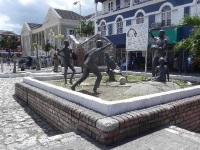 The square includes several heritage structures: the Sam Sharpe Monument, the Cage, the Civic Centre and the Freedom Monument and a fountain. The Sam Sharpe Monument, designed by Kay Sullivan, portrays Sharpe holding his Bible and speaking to his people. 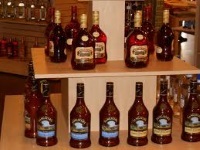 The five statues were cast in bronze in Jamaica. They were unveiled by the then Prime Minister the Most Honourable Edward Seaga on October 16, 1983 at a ceremony in the Square. Built in 1806, the Cage was used as a goal for enslaved Africans, disorderly seamen and vagrants. About 1822 the Vestry replaced the wooden structure of the Cage with one of stone and brick. The Cage has since seen a number of uses. The Court House, now the Civic Centre, was built in 1803. It was at this Court House that the trial of many of the enslaved Africans, including Sam Sharpe, who participated in the Emancipation War, was held. Sharpe was tried here on April 19, 1832. By 1959 the court offices and local government offices had become too large for the building to accommodate them and the court offices were moved to new premises on St. James Street. The court house was destroyed by fire in 1968. In 2001 the building was restored by the Urban Development Corporation, with funding from the Venezuelan Government through the San Jose Accord. 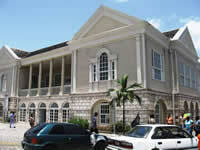 The building was reopened as the Montego Bay Civic Centre. It is a multifaceted facility with provision for a museum, art gallery, performing arts and conferencing facilities. The Freedom Monument was erected in 2007 to memorialize the enslaved persons who participated in 183132 war of emancipation.